Does your child know how to classify triangles? 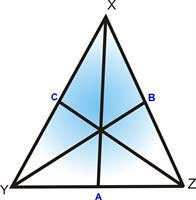 In this article, you will know about the properties of triangles. Geometry worksheet will help to recognize angles and sides of triangles. A triangle is a simple closed curve made of three line segments. Triangle has three vertices,three sides and three angles. We can classify triangles according to their Sides and angles. 1.Equilateral triangle: If the triangle has three equal sides, and therefore three equal angles, then the triangle is called Equilateral triangle. 2.Isosceles triangle: If the triangle has two equal sides, and one unequal, it is isosceles triangle. 3. Scalene triangle: If a triangle has sides of three different lengths, and therefore three different angles, we call it a scalene triangle. 1. 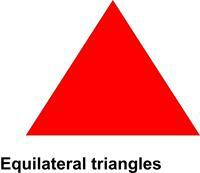 Acute-angled triangle: A triangle having all acute angles (less than 90°) in its interior is Acute-angled triangle. 2. 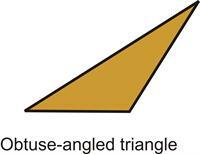 Right-angled triangle: A triangle that has a right angle in its interior is Right-angled triangle. 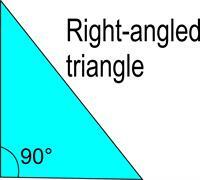 (greater than 90° but less than 180°) in its interior Obtuse-angled triangle. 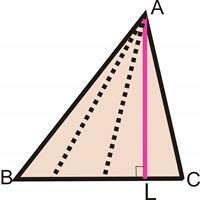 A median of a triangle is a line from a vertex of the triangle to the midpoint of the side opposite that vertex. Every triangle have 3 medians. These three medians meet at one point - centered of the triangle. In a triangle, a segment drawn through a vertex Perpendicular to the opposite side is called the altitude or hight of the triangle. 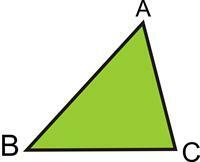 The three altitudes of any triangle are concurrent. Activities help students become familiar with the basic principals and concepts of Geometry. First students have to cut two pieces of string in identical lengths. They then use a protractor to connect the strings to the paper to create a triangle. Once the triangle is constructed, students have to measure each side of the triangle and define its properties. Make a several cut out of triangles with cardboard in different sizes. Then measure each triangle by their sides and their angles. Try to classify triangles as you can. Here you will get many worksheets for practice concept of triangle and its properties. These math worksheets help make learning engaging for your child! Browse through and download our Maths worksheets to get better Education.